Ok, ok … enough with the cracking of whips, I’m working on her! Madorsa quested her way through Un’Goro Crater this weekend, finishing up her time in old Azeroth. 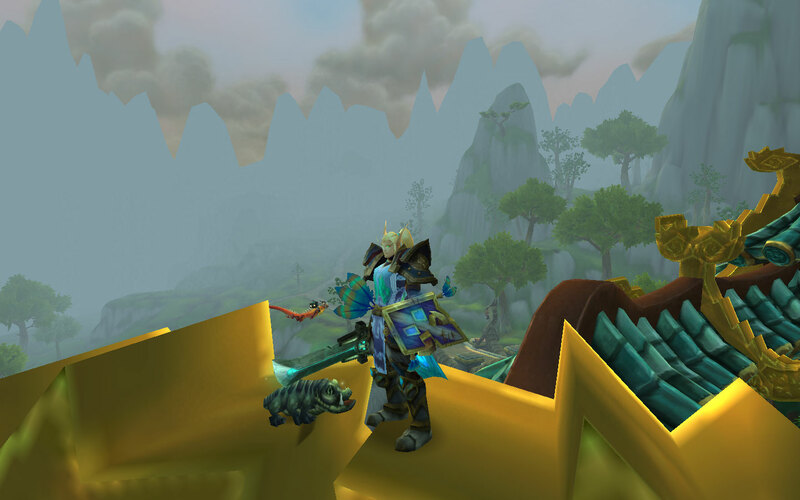 She had stayed in the Eastern Kingdoms up until now, but I hadn’t seen the changes to this zone and wanted to find out for myself why some idiot human is yelling about dragons all the time. Seriously, Maximillian is worse than the Sha of Anger. And that quest … well, it’s silly, but I can’t say she didn’t enjoy riding around with him, especially the last part. She did have to spend the last level and a half in the Blasted Lands, which was ok because she needed more runecloth and a lot more enchant mats to get her professions up to Outland mats. Averry had sent me a full mail of mageweave to get me past that hump (thanks again that was super awesome! ), but I didn’t want to bother him for the runecloth as it is easy enough to farm. So I sent the DK on a mission to Blackrock Spire. She ran upper to get the attunement for BWL, zoned out to sell things on the mammoth, then ran lower. That gave me a ton of cloth and, well, a few greens. I finished up the tailoring but was still far short on the enchanting, so I sent her back out … first to MC which was a complete waste of time other than one pet, and then to AQ easy. That was reasonably productive but geez … there just aren’t enough green drops. I gave up for the time being and sent Madorsa to Outland. 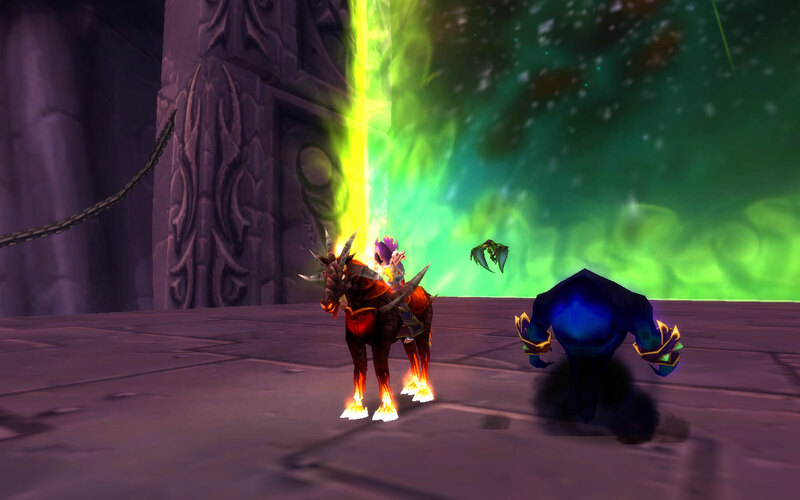 Hellfire was not too badly crowded and I wandered around doing quests until 60. 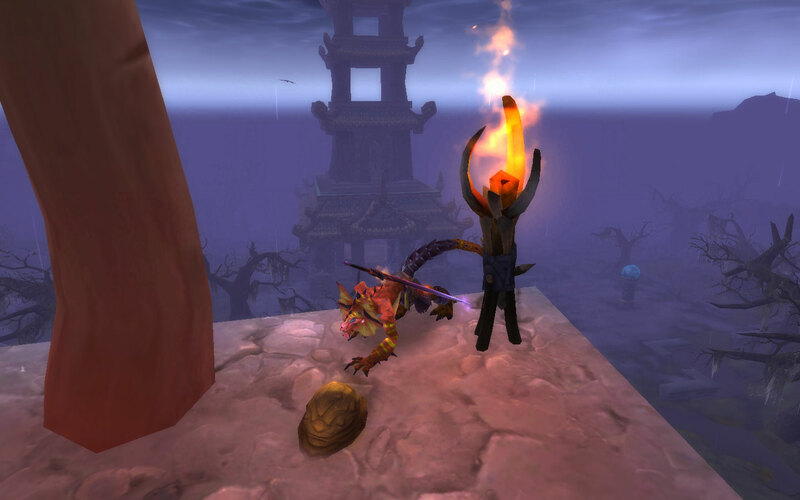 Then I headed to Zangarmarsh and CRZ hit me square in the face. The first quests are rough even with no competition, but with at least 6 other characters also trying to kill the same mobs? Mayhem. Or, rather … a whole lot of standing around looking at a village full of corpses. I mean, the witchdoctors were always scarce compared to the other mobs. And once I did get through that, the next place is the cave where you kill bog beasts that are attacking sporelings. Yeah … I literally spent 45 minutes running circles in that place. Respawns died as fast as they spawned. Exactly WHY do they want the leveling process to be so painful? I don’t want the world to feel more populated, I want to be able to kill what I need and move on! Eff CRZ!! *ahem* Anyway … I moved back to Hellfire for a little bit until I hit 61 and got a quest to head to Swamprat Post, where I could pick up several quests that weren’t concentrated in a small area. I think now that I have the freedom to move around the map it will be better. It was time for LBR though, and as luck would have it, the schedule this week was AQ! There were only 3 of us, but Flags and Cain were nice enough to carry Madorsa through the first one. I swapped to Kirgra for 40 though … it would be tough keeping a level 60 alive in there. I got a few mats, not as much as I was hoping but it did help. Supplemented by the AH, I managed to get Madorsa’s enchanting to 300 before logging for the night. 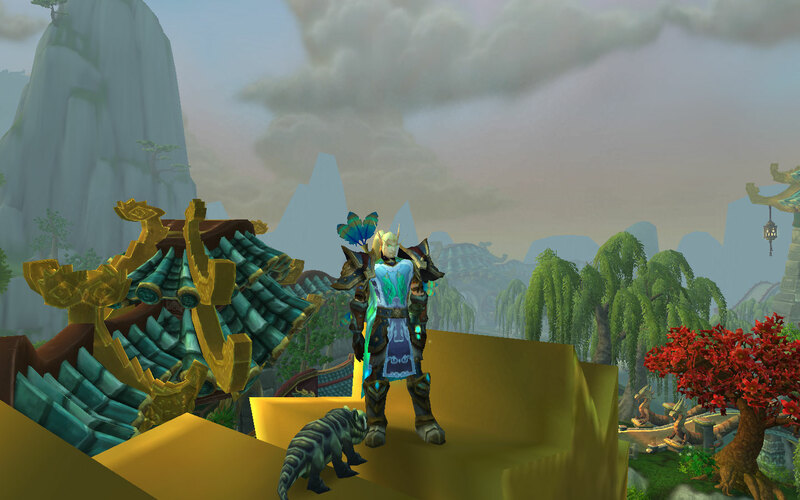 What really pulls it together is the Order of the Cloud Serpent tabard. Now he’s in all aqua and lavender, perfect for spring! After that was done and I’d beaten all the elite pets, I headed out to Townlong to see what Shado Pan dailies were up and maybe go to Thunder Isle. Earlier in the day I had been reading about G’nathus … somewhere. Must have been at Warcraftpets. Anyway, since the dailies were up at Shan’ze Dao, I decided to go check him out. He’s just an elite, not even a rare spawn, so he’s pretty sure to be around. I found him, said oh 4.3M health I can do this, jumped in the water and got 2 shotted. Oh. That’s 43M health, no period. Heh. Oops? Ok, let’s see who’s on. Oh, just Shirl and Zarm. Well … I got them to join, and roped Averry into coming to help as well. Zarm tried bear tanking in kitty spec … with the same result I had. I checked my list again … oh! Arv is on, he’s just on a non-SR toon. So he swaps over and now we have a real group, even though Zarm had to leave. It was pretty easy to talk people into helping, since he has a guaranteed drop of the pet Spawn of G’nathus. Shirl won the first one, and once I mentioned the 10 min spawn time (which might actually be 15 min but no one complained) everyone was game to stay and get more. Averry stayed too even though he wasn’t interested in getting one of the pets. He’s awesome like that. Shadeey logged on between pulls and we got her to come too, so that meant we needed four kills. Yeah, he’s so big you can’t see him there, but he’s a giant purple eel. 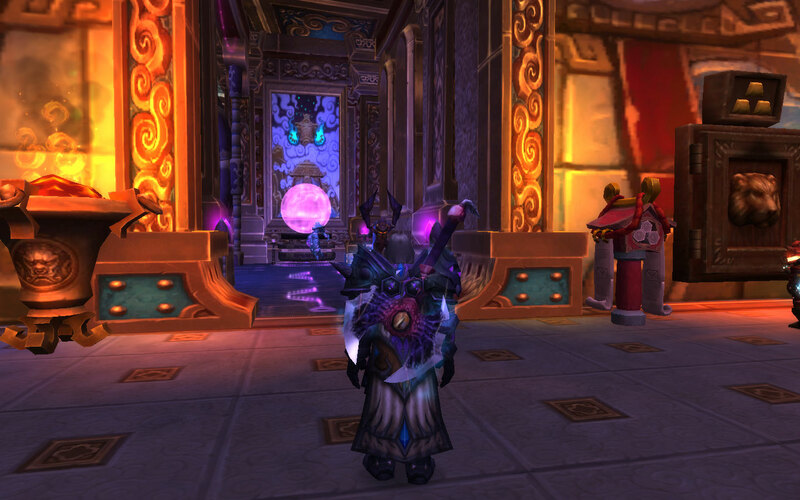 I had the priest NPC from the Shado Pan along with me since I was going to do the dailies. It’s kinda funny there seeing my ‘pet’ throw a 68k holy fire on him. Having Shadeey’s dps made quite a difference in how long it took us to kill him, too. Between pulls, of course, Arv pulled toys out of his bag. He must have to get out his mammoth and sell junk every time he loots a corpse. Of course, my favorite is always the hitching post, so I had to get a screenshot on a pony. I posed next to Averry while he was taking his dog out … surprise! You’re getting posted on the blog. hehe. I did fail to take a screenshot WITH the pet though. Uh … oops again? After we finished getting the four pets I got those dailies done and hit exalted with Shado Pan. I didn’t screenshot any of that, though you will likely see me mounted on that onyx cloud serpent at some point. I still have only completed one NPC for Getting Around With the Shado Pan, and have mostly given up on Know Your Role, so I’m undecided on whether I will bother doing any more dailies for them or not. I guess I should pick up one of the hats though, huh? So … you’ve just dinged 90 and have an ilevel of 438 … what do you do next? Meh. I’m a blood DK, I dun need no gear! Isle of Giants here I come! Yes .. really. I sent him straight off to farm bones. Where Van with a 490+ ilevel had to use all CD just to kill a single direhorn hatchling, Kaly was at full health when his died. Sure, it took forever, but I was never at any point in danger of dying. I think I’ll try pulling two next time just for the hell of it. My dino project was cut short by LBR time though. Since I was already on Kaly I just took him. 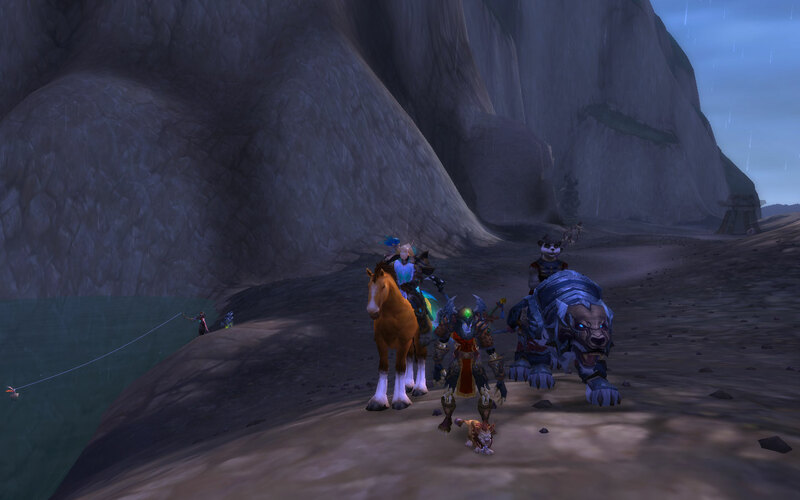 Even though there were only four of us, we dispatched TotC in no time and decided to hit up Naxx and AQ for pets again. I’d been looking for a weapon to match Kaly’s T10 mog for a screenshot I have planned, and C’thun was nice enough to drop this fancy axe with an eyeball in the center that actually opens and closes. Dang, I need to level a third class for the next achievement, but I was working on another DK … bah. Makes it too busy at work to do any sort of meaningful post so here, have a pretty picture of Van playing Saurok superhero. Note I said SAUROK superhero, not Sorak superhero, because only one of those things exists.